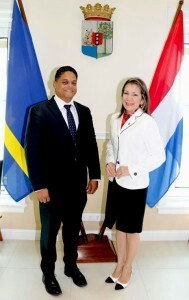 WILLEMSTAD - Prime Minister Eugene Rhuggenaath has summoned the Venezuelan Consul General Mrs. Marisol Gutiérrez de Almeida at Fort Amsterdam. During their meeting, the government of Curaçao has requested the government of Venezuela, through the Consul-General, to implement the agreements of January 12. Venezuela closed its borders with the ABC Islands unilaterally because of smuggling. Certain agreements were made in Aruba to normalize the situation again but Venezuela has not done anything so far.